Jake Humphrey hosts the general knowledge quiz where contestants can win money if they can give a correct answer to a question before all their opponents in The Pack do. Browse content similar to Episode 3. Check below for episodes and series from the same categories and more! Eight contestants, all with a chance to win thousands of pounds. Only one will start in control. Can they stay ahead and Beat The Pack? you can win up to £12,000. and earned the right to return as our control player on today's show. -James, come and join me. Good to see you again. A familiar face for us. -A familiar room for you. Last time, you survived all the way through to the final. You then won the final. What's the lesson you learned from that? so I think I'll be going slowly-slowly cautious today. Last time, you made it to the final but you were playing for control of the game. Today, you are playing for money. You're starting in control, with the chance to win up to £12,000. the only thing standing in your way is The Pack. Let's meet them. Karen, financial investigator from Sussex. Jack, broadcast journalism student from Hartlepool. Emma, a communications manager from Cheshire. Barry, recruitment consultant from Aberdeen. Jean, a facilities manager from Hadlow in Kent. Rob, speciality cleaning manager from Surrey. Becki, sales administrator from Pontefract. who are you most concerned about? I'd say Barry, a fellow Scotsman. He would be the number-one danger. But quite a few of them could pose a problem. Barry, the pride of the country's at stake. You against James, for the crown of Cleverest Scotsman on the Show. -but rather me than him. -You mean rather him than you?! Let's hope you get the questions right more often than that! -Shall we look at your categories? Each category is worth up to £2,000. for the chance to win up to £12,000. he's out of the game, no second chances. If he doesn't like a question, he doesn't have to answer it. I'll replace it with an easier one, but that will cost him. The money halves every time. The Pack will be answering every question. he loses control, he goes home with nothing. And that's not all. One of The Pack will then take his place. -James, are you ready to do this? -Let's play Beat The Pack. Six categories. You need to pick one to start with. I'll kick off with Opera. OK. James's first category is Opera. One more thing before we get going, I will give you a helping hand. You'll have the chance to give me a double answer. Let me know when you want to use it. -Make sure you use it wisely because you only get it once. This is James's first question. Pretty quickly, all seven members placed their answer. Now we need one from you, James. The first question - play or pass? If I was brave, I'm between Wagner and Rossini. you're out of the game. I'm afraid...I've not got the guts. I'm going to pass it and hope that The Pack are in the same position. Let's have a look at the correct answer to this £2,000 question. -Being brave pays on this show. -Next time, I'll just need to be a bit bolder. -If there is a next time...! before it even got going James's game is over. It's from the opera "Lohengrin". Did our pack know the correct answer? Let's take a look. Three members of The Pack straight through to the Safe Area. Jean, Rob, Becki, breath a sigh of relief and go and relax. So three members of The Pack relaxing in the Safe Area. Great for them but pretty bad for you. which means it's you against four members of The Pack. An easier question for you, but an easier question for them. Here is the £1,000 question on Opera. James, think carefully. Pack, give us an answer, please. Pretty quickly, The Pack are locked in. Are you feeling more nervous now it's just you against four? It's a tough one. I mean, Carmen would draw me to Spain. Don Giovanni would draw me to Italy. and hope I can have a go at the £500 question. So, you're going to pass on this question? I've got no other option. James is going to pass on the £1,000 question. and there's now only four members of The Pack for you to take on. Let's have a look at the correct answer. The correct answer was Spain. but just not brave enough to go for that answer. What did our pack think? Karen, Jack, Emma and Barry are left. it's farewell to James a bit too early. Let's see how our pack did. Who got that question right? You lose half The Pack with the question. Emma, are you an opera fan? I'm not an opera buff, but I do know Carmen. -but Carmen drew me in the end. and you can go and relax in the Safe Area along with Karen. Karen, congratulations. Did you know the answer? I'm happy to have picked the right answer. Well, you don't need any help at all because you got the answer correct. -Go and relax. Well done. Now we have three men answering questions on opera. None of them look very confident. An easier question for James, but also easier for The Pack. This is the £500 question on opera. James, have a think. Pack, please answer now. I'm not saying they're super easy, but they answered just like that! -Are you going to play or pass? Hold on, you used the word "slightly". Only slightly? If I was at home, I'd be screaming the answer. -What answer would you be screaming? as NOT one of The Three Tenors. -Yes, I think I am. OK. James is saying D, Mario Lanza. Let's lock in James's answer. you've completed this category and a member of The Pack will leave. If it's the wrong answer, your game is over. was Mario Lanza NOT one of The Three Tenors? Indeed he wasn't! Well done. Correct answer. You have some money in the bank. Mario Lanza was a Tenor, but his career was in the first parts of the 20th century. -That's the correct answer for you. Shall we put £500 in your bank? Here we go, then. I'm sure this always feels nice. self-confessed non-lovers of the opera, remain. You have to choose one to leave. Who would you like to get rid of? -I have to get rid of Barry. -Did you know it was Mario Lanza? I did know it was Mario Lanza, yes. Barry, thank you for playing. -But, Barry, time to leave The Pack. Bye-bye. Let's bring back the remaining pack. Back you come. and five categories, worth up to £10,000. You said opera was tough. Do you want to go somewhere easier? I'm going to stick with things I don't particularly know. -I'll go for a bit of cheese! James has chosen Cheese. Let's do it. worked on a cheese and meat counter at a supermarket. The question is who, and how much do they remember from the work they did? Let's look at the £2,000 question in the Cheese category. James, get thinking. Pack, please get answering. So six answers are locked in. but I'm not willing to risk it when I'm out here. James has chosen to pass on the £2,000 question. Jarlsberg is not traditionally made with sheep's milk. -You had no idea, did you? Let's see which of our pack got this question correct. Two correct answers - Emma and Becki. is glad that you've remembered some of the knowledge! I'm guessing you knew the answer. and, from what I remember, Jarlsberg is like a harder cheese! -I'm starting to think you don't remember very much. -It was years ago! I was a student! Emma, Becki, go and relax. Well done. You're through to the next category. So, James, they're through, you are not. We move on to the £1,000 question. Easier for you, remember, easier for The Pack. There's only four members of The Pack now up against you. Pack, please answer the £1,000 question now. Four answers are locked in. Are you going to play or pass? I'm going to not be brave to answer, but be brave to pass it on. You've decided to take the risk and assume The Pack don't know. The answer was sage. You weren't convinced at all, were you? -No, I'd have been guessing. Often known as Sage Derby. Have any of our pack eaten such a cheese? Let's find out who knows the answer. -And it's Rob with the right answer! Breathing a sigh of relief! Rob, you're back in the Safe Area again. -Did you know the answer? -One of your favourite cheeses? -I like lots of cheese. I know it's hard to believe! But I can't believe I got the first one wrong. You were annoyed with yourself. But it hasn't cost you your place. You're through to the next category. All that cheese-eating has paid off! Go and relax in the Safe Area. -You're wishing you ate cheese a lot! -Yes. Ate cheese at the opera! -That's what I'll do from now on! -That would've been helpful. Sadly, you did neither. We're now down to the next question, this time worth half again. This is worth £500. Let's look at the £500 question in the Cheese category. I'll take your answer in a moment. First, pack, could you please answer now? The pack lock in their answers. You up against three... play or pass? You're going to pass on the £500 question? First of all, let's reveal the correct answer. You decided not to answer. But The Pack have all answered. Who got it right? Let's find out. Three correct answers from The Pack, James! which means, James, you're out of the game. -How much do you regret not using that double answer? And maybe it was the wrong strategy to start off the weakest and try and build up. but I'm afraid to say you failed to beat The Pack. -We need to say goodbye. -OK. Thank you. Thank you. Let's bring back The Pack. So James has gone, the victim of being a little bit over-cautious. That means we have a vacancy. Which one of our Pack is about to take control? -..Becki! Becki, down you come! -Hello, Becki. Lovely to meet you. I haven't seen much of you this game because you've been sitting in the Safe Area. -What do you do for a living? -I'm a sales administrator for a stationery wholesaler. which means you could walk away with £8,000. -What would you do with it? I've got a little boy. It'd be nice to take him away. -You've been up there in The Pack. -You know them quite well by now. Who worries you? Who do you think's good? I think Karen's silent and could be quite stealthlike. We haven't had much from you, Karen. Are you silent and stealthlike? -Is that a good description of you? -I don't think silent and stealthlike, no! You've caught Becki's eye, so we'll see how the game pans out for all of our Pack. -Are you ready to play on? -What would you like to go for? Becki's going to play Vampires. Here we go. This is Becki's £2,000 question on Vampires. Becki, don't shake your head just yet! You can give me an answer in a moment. The Pack have all answered. There was a shake of the head from you. -What are you thinking? Play or pass? but I have no idea. I think I'm going to pass. I'm hoping someone won't know the answer. So on the £2,000 question, Becki has decided to pass. It's understandable. If I'd pushed you, you would've said 1400s? Yes. If there wasn't a pass option, I would've gone for 1400s. Let's reveal the correct answer to the £2,000 question. -Sometimes your instinct really has to be listened to. You didn't, which means we turn to The Pack. and they all got it right, Becki's going home. Let's see who got the correct answer. which is brilliant news for you. Your strategy clearly paid off. It's as bad for you as it is for The Pack! The good news is, they're all still in play. The bad news, that cost you £1,000 and you could've got the answer. -I'm sure you're kicking yourself a little bit. There's £1,000 that could be won on this next question. It is halved. It is worth £1,000 still. Becki, you have a think. Pack, please answer now. The Pack have all answered. -The first vampires question was a shake of the head. This time it was a rather confused look. than with the previous one. Well, I've obviously heard of Christopher Lee. -You'd also heard of Vlad the Impaler! The choice is yours, Becki. You're in control. Play or pass? I'd rather know I was going to get it right. Let's have a look. Becki has decided to pass on the £1,000 question. your game is over before you've banked any money. So let's see. What was the correct answer? -Really glad that you passed? Bela Lugosi played Dracula back in 1931. Did our Pack know the correct answer to the question? Let's take a look. Four of our five pack members knew the answer, Becki. Well, well, well... Rob and Jean both got that right. Jean, you knew the answer or that was a guess? No. I like vampires. I've loved them since I was about ten. OK. Well, it paid off for you. -Emma, did you know the answer? -No, it was a guess! Well, the important thing is, it sends you through to the next category. you played that brilliantly. You got the correct answer. You're through to the next category. Go and relax in the Safe Area. -Jack, we've yet to hear from you. I'm guessing you're not a vampire fan. Which is why you're standing there. On my own! I look a bit thick. Never mind. Well, Jack, you know the situation. You or Becki will fall during this category. -which of you is going? because it really is Jack or Becki, but which of you? This next question is worth half as much because you passed. The vital thing to remember here is, it's easier for you but it's also easier for Jack. If you pass and he gives us the correct answer, you're out. Get the right answer, Jack leaves. here's the question for £500 in the Vampire category. Becki, I'll come to you in a moment. Jack, give us your answer, please. Very quickly, Jack places his answer. You're looking nervous. You, Becki, for the first time, haven't let out a sigh of despair. I think possibly by that, you may know the answer to this. The very famous Twilight Series. -You're going to play with Twilight? Let's lock in the answer "Twilight Series". OK. Let's find out, then. Has Becki secured her passage to the next category? Is Twilight Series the correct answer? She stays in the game. Well done, Becki. -It took us a bit of time to get there, didn't it? -You can breathe a sigh of relief. -That's £500 for you. Shall we add that to the bank? "Hopefully Jack will be the one to go". I'm afraid to say it was your turn to leave. -Definitely. Nice easy one. Fair play, Becki. at just the wrong moment. It's cost you your place. Jack, I'm afraid I have to ask you leave The Pack. So it's farewell to Jack, but let's bring back The Pack. OK, Becki, you're still in control. -Is it time to start winning some serious money? you've got £500 in the bank. if you play the perfect game. I think I should get Rivers out of the way. -Let's get Rivers out of the way and hope it doesn't sink you. Here's your first question, Becki, for £2,000. Becki, have a think. Pack, please answer now. Four pretty quick answers coming in from The Pack. -I think I'm going to play. -I'm going to go for it. That's a really brave thing to do! Last time, you banked £500. -Is it because you really want to start getting some money? -I am thinking Indian Ocean. Do you give us one answer? Do you use your double answer? -How do you want to do this? -I think I might use my double. -Lock it in, she says! Let's do that, then! Becki has said "I'm going to use my double answer". I think it's going to be South China Sea! Let's see, Becki, if you've picked the correct answer. First of all, does the River Mekong drain into the Indian Ocean? and she's through to the next category. -No, it is not Indian Ocean! -..Yellow Sea as your second answer. you've lost the £500 you banked. You're out of the game. -Do you know the correct answer? -It is the South China Sea, I'm so sorry to say. -that it cost you your place on Beat The Pack. I'm gutted! I really am! -Becki, I'm afraid you didn't Beat the Pack. You have to leave the show. Thank you so much for playing. which means one member of The Pack is about to replace her in control of the game. On that last question, three out of four got it correct. It's a strong pack up there. But who's the strongest? ..Emma! It's your chance to shine! Come on down! -Hello. Nice to meet you. -I loved that reaction! "Ooh!" -You're surprised that you've been the strongest player? -It's been close. There's some really good members of The Pack. -Let's find out a bit more about you. Where are you from? -And what do you do for a living? -I'm a communications manager in the property sector. What are your strong areas, your areas of expertise? -I'd say fashion, but there's nothing on fashion. but they're worth up to £4,000 for you. -What would you do with the money? -I'd like to take my husband on safari. He's a keen photographer. That'd be lovely. so I'd like to do something nice for them. -Maybe take them on a safari, as well? -No. Maybe for a meal! -That's enough! Not two weeks, though. You were part of The Pack. Now you're aiming to beat them. -OK, Emma, let's play Beat The Pack. Having discussed lowbrow, both of these are quite highbrow. -Did you watch The Olympics? -I did. It was absolutely fantastic. -Some good presenters on there! I'm leaning towards The Olympics. I feel that's something I'm probably stronger on. Famous Brothers could be absolutely anything. -You're going to have to be tactical, brave. -What shall we go for first? -I think I'll go with The Olympic Ceremony. The 2012 Olympics Ceremony is her first category. This is focusing on the opening ceremony. Emma, have a think. Pack, please answer now. -Pretty quickly, the answers have been locked in from The Pack. She's going to play! She's full of confidence! If you get this right, it is the perfect start. We're only two categories away from the final and you will already have £2,000 in the bank. Get it wrong, it's "hi" and "bye" pretty quickly. -So, why do you want to play? so I'm fairly confident of the answer. -Are you so confident, you don't want to use your double answer? -I'll save it for the last question. -Wow. You're really positive you know the answer to this. Right, then, Emma, let's do it. Give me the answer. This is where it gets really exciting. Emma, if it's Thomas Heatherwick, £2,000 straight in the bank for you. and you will choose any member of the remaining Pack to eliminate. -If it's wrong, I will say goodbye. It's quite natural. Let's see whether you're correct. and Emma's going to play. She says it's Thomas Heatherwick. Is that the correct answer? It is the correct answer! Wow! Well done! Listen to them in here! Almost a standing ovation. It's like you've won a gold medal. Wow. I presented The Olympics. Not even I knew the answer! It's time to put £2,000 in the bank. Emma, take a look. -Right, we've done the fun part. -Now we do the nasty part. You've stood with The Pack for the whole show. having successfully completed The Olympic Ceremony category. Who shall we say goodbye to and why? It's very tough because I think they're all very strong players. So I'm going to have to say bye to the only gentleman left. Well, Rob, you played a great game for so much of it. However, Emma decided you were too good for her. -Maybe you can take it as a compliment. -I'm afraid to say you need to leave The Pack. Thanks for playing. Rob walks away from Beat The Pack. Karen, did you get the right answer? Yes, I did. I watched the opening ceremony. -Yes, I got that one right, as well. Karen and Jean are all on great form. Let's see what happens in the next category. This is also worth £2,000. More importantly than that, this is the final category. -This is all that stands between you and being in the final! -Shall we see what the question is? The final category today is Famous Brothers. Let's have a look at the £2,000 question. Emma, you have a think. Jean and Karen, please answer now. -They both answered quite quickly. -You know how good they are. We know they both got the last question right. -How does that affect your thinking? Play or pass? On the final category, straight in there again, she's going to play! -You still remain able to use the double answer. -Maybe you're so confident, you're not going to worry. -I am going to use it. -Because there's a few options up there. I'm pretty confident that it's Ralph and Joseph Fiennes. -This is such a vital time in the game. -To leave now would be a shame, with the final around the corner. So Emma's decided to use the double answer. is the answer C, Noel and Liam Gallagher? -But you don't seem too concerned. -The answer you were certain about was Ralph and Joseph Fiennes. Is the correct answer Ralph and Joseph Fiennes? with the potential to win £4,000 at the end of today's show? -She's done it! She's through! You simply could not have played a better game. How do you feel? -I'm so happy for you. and you're quite right, the Afflecks' combined age is only 77. You knew it the minute you saw it. It was the right answer! It's worth £2,000. -Shall we put that £2,000 in your bank? And now we have to choose who you would like to take on in the final. Emma, you spent most of the show standing up there. You know what kind of player Karen is. You know how quickly Jean answers these question. You need to take on board all that you've learned about them and send one of them home. -Who's that going to be? I think they'll both be strong finalists. I'm going to take on Karen in the final. right at the very end you've been sent packing by Emma. You were the strongest member of The Pack. There's nothing more that you could've done to have a good game. But I think that perhaps you were too good for Emma. Jean, bad news for you. I'm afraid I must ask you to leave right at the end. -Thank you so much for playing. Wow. How high is the standard on today's show? Emma had the chance to go into the final with £4,000 in the bank. She's only gone and done it. the one remaining member of The Pack. Let's play the Beat The Pack Final. Here we are in the final, and what a way to get here. and made it here with the maximum £4,000 available to her in the bank. Emma, you will face 75 seconds of quick-fire questions. Keep on getting the questions right, which you seem quite good at, and you will leave here a winner. I'll stop the clock and Karen will be given the chance to answer that same question. you will steal all of Emma's money - £4,000. Emma, to prevent that from happening, you must stay in control. -OK? Shall we do this? In animation, what is the name of Wallace's canine companion? Googly is a term used in which sport? A water molecule consists of one oxygen atom and two atoms of which other element? In the well-known nursery rhyme, Doctor Foster went to which British city? Tom Cruise first played Ethan Hunt in which 1996 film? In Greek mythology, what was the name of the three-headed dog that guarded the underworld? Steinway & Sons are manufacturers of which keyboard instrument? William Hague is a prominent member of which political party? Who led the British Forces at the Battle of Trafalgar? Karen, who led the British Forces at the Battle of Trafalgar? -Is the right answer. You've got the first steal. Well done. with 26 seconds left, Karen, you needed to get that right. -Emma, you're saying you knew it. -I knew it. My dad will kill me! -The pressure was getting to you! Emma, you've got 26 seconds. You must stay in control to walk away with that money. The time starts now. A twister is another name for which weather phenomenon? The name of which Japanese drink translates as "rice wine"? Alexander Fleming was a joint recipient of a Nobel Prize for the discovery of which antibiotic? Which member of the Black Eyed Peas has also been a judge on the TV talent show The Voice? In the novel by Anna Sewell, what type of animal is Black Beauty? That brings us to the end of the game! Wow! Emma, what a way to come on this show and dominate. You had the chance to win £4,000, you took the opportunity. You came into the final and you nailed it. -Karen, you didn't get a look-in, did you? One opportunity to give me a correct answer, you managed to do that. -Sadly, I needed three from you. Emma, you weren't going to give Karen that chance, right? -What are you going to do with the money? -I'll take my husband on that safari. -And definitely treat my mum and dad. -Don't forget sorting out Mum and Dad! -I'm sure you can spare 20 quid! You've been amazing. It's been a pleasure to watch you play. -You have managed to beat The Pack. Well done. Wow. What a player, hey? win £12,000, but only if they can beat The Pack. 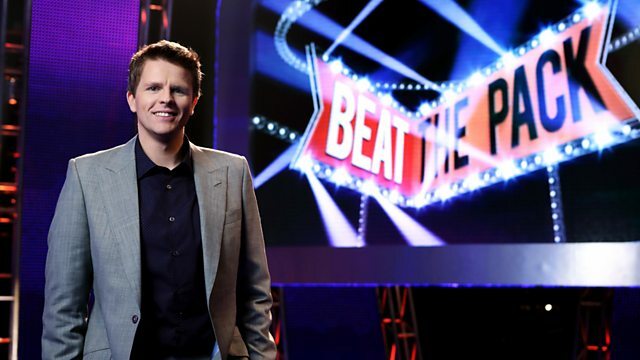 Jake Humphrey hosts the general knowledge quiz where contestants can win up to £12,000 if they can give a correct answer to a question before all their opponents in The Pack do. Contestants in control must play a strategic game to take home as much money as they can.